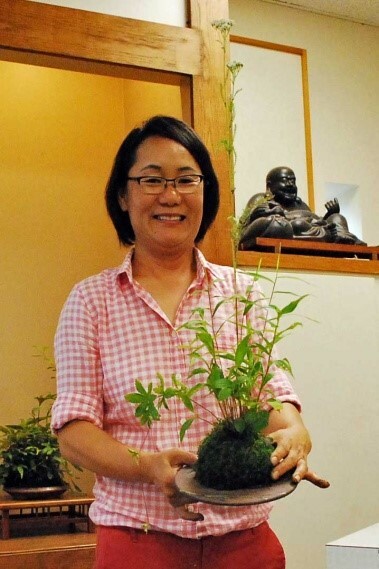 Recently the Susquehanna Bonsai club had a presentation on how to make kusamono and kokedama. The club was honored to have Young Choe as the presenter. Young Choe has studied extensively on these subjects and travels all around the world teaching the arts of kusamono and kokedama. Young studied kusamono in Japan under master Kusamono artist, Keiko Yamane, a former student of Saburo Kato. Please enjoy reading the below notes from our latest club newsletter (editor – Ross Adams) written by club member Darlene Tyler. Thanks for the article Darlene! Kusamono are potted arrangements of wild grasses and flowers in unique pots or trays selected to suggest a season or place where they grow. There are three basic styles of Kusamono: moss-ball ( Kokedama), out-of-pot, and container. Many meadow and woodland plants are suitable for Kusamono compositions including blue stem grass, flowering onion, Japanese anemone, goldenrod, Iris cristata, Virginia strawberry, shining sumac, ferns, lily of the valley, Epimedium, chrysanthemum, Canada mayflower, red columbine, American wintergreen, narrow leaf mountain mint, Solomon’s seal, cobra lily, culver’s root, hawkweed and Japanese blood red. Young chose a naturalistic tray-like container for her first composition. Think about the color of the plants and flowers and the container. Choose the front of the container first and add a layer of potting soil (Buffalo Organic Potting Soil or fine grain Kanuma and charcoal). The pH of the soil should be about 6.5. Next add the rocks on top of the soil. The rocks were chosen and carefully arranged on the tray. Use 1, 3, or 5 rocks and leave space in front and place rocks slightly to the middle-side of the container. Be happy with each step of the process. 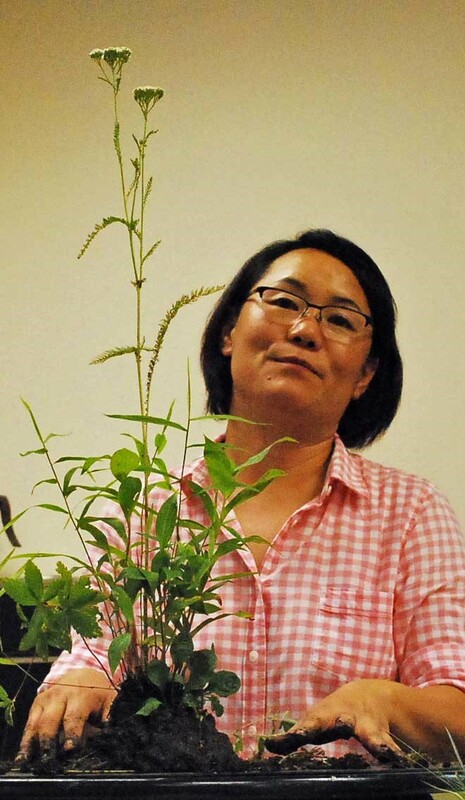 After the arrangement was pleasing to Young, she chose a woodland aster as the first plant (the tallest plant is placed first). Loosen up the roots of the plant but don’t cut too many roots in the summer. The wood aster is placed with its face facing forward between the rocks and more soil is added. Golden rod, Chrysanthemum crispum( a small flower and white edged leaves), a spring flower (Oenothera) and Campanula were added. Be sure there is soil between the rocks and the plants. A fine moss was added to finish the composition. Use chopsticks to push the moss into the soil. Water with a fine spray and keep it in shade for two weeks before introducing it to part shade. Do not allow the plants to dry out. Muck soil is used to create moss balls. Add enough muck to the soil so that the ball will maintain its shape. The ball is created on top of a tile or screen which has four wires protruding to attach the ball. Start selecting a combination of plants that seen to relate to each other place the tallest plant first than the supporting plants adding more muck tot the ball as needed. Finish off by applying moss to the composition. Press the moss into the soil and affix it to the ball with fine black thread. Oat grass, golden rod, penstemon, and chrysanthemum were used for one of the balls. When the composition no longer absorbs water, it is time to separate and re-pot a kusamono. Thanks for reading and for more info about Young Choe, please check out her website provided below. Young’s website is http://www.kusamonochoe.com for more information about Kusamono. 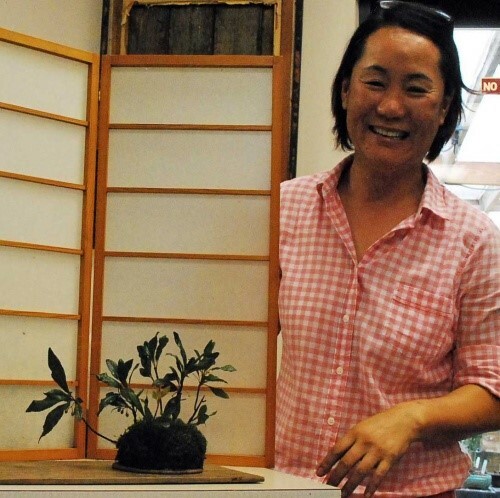 Categories: Guest Bonsai Artist, Young Choe | Tags: bonsai, bonsai club, kokedama, kusamono, Pennsylvania, Susquehanna Bonsai Club, young choe | Permalink. 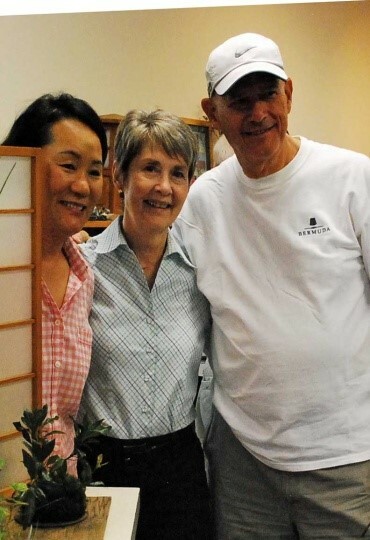 The Susquehanna Bonsai Club recently had a demo on the art of kusamono. The club was fortunate enough to have a very well-known and talented Young Choe as the demo speaker. Kusamono is a Japanese botanical art that developed alongside bonsai. The earliest reference to kusamono that Young has found is 1784 and the earliest pictorial reference she uncovered is a nineteenth century Korean block print. Kusamono is an arrangement of wild grasses and flowers in unique pots or trays selected to suggest a season or place. The name is composed of two Japanese characters – “grass” and “thing” – which together suggest humble, everyday plants or even weeds. Originally, the name referred to the small potted grasses displayed next to bonsai as accent plants. More recently, kusamono has developed into an art form of its own. A well designed kusamono reflects the season in which it is displayed and also suggests a specific natural habitat. There are three basic styles of planting, namely moss ball, out-of-pot, and container. When creating a kusamono choose one, three or five plants that grow in the same environment (wet or dry, sun or shade, etc.). The potting mix for a moss ball kusamono is composed of equal parts of muck soil, Kanuma, and Akadama. Mix all together and make a wet paste mixture. For the base of the moss ball use a plastic screen with two tie-down wires or a specially made round tile. In her moss ball demonstration, Young started with a tall Queen Ann’s Lace plant and stabilized it with the soil-muck mixture. Next she arranged the supporting switch grass and strawberry plants with more of the soil-muck mixture. When the plants were arranged, she adjusted the wires, trimmed the plastic mesh to the same size as the moss ball, and applied moss to the surface using a chopstick to push the moss into the soil. For display, she placed the composition on a round tile. Spring bulbs (snowdrops work well) can be inserted into the moss ball for spring appeal. Aluminum sulfate will make the moss grow better. Usually use one type of moss in a composition. Keep a new planting in the shade for two weeks and then gradually expose it to more sun and grow in part sun. When not displaying the kusamono, store them in a big tray with crushed granite and place the moss balls on top of the granite. Create kusamono before you are ready to display it so it looks professional. With care the composition can last a long time, when it becomes root bound, recreate in a different pot. Native plants, tropicals and sub-tropicals can all be used to create kusamono. The temperate zone kusamono can be wintered(above freezing) with your bonsai but will dry out more quickly and have to be watered more frequently than the bonsai. During the growing season, water frequently and plants in pots require extra watering, but do not use a finger check before watering. If you are having trouble getting the soil wet, place the pot in a saucer and water from the bottom. Young’s background includes horticultural studies at the University of Maryland, art-ink painting and calligraphy studies in Korea and kusamono training in Japan with the master kusamono artist, Keiko Yamane. Young has been associated with the National Bonsai and Penjing Museum for many years. There is an exhibit of Young’s work on the National Bonsai Foundation’s website at http://www.bonsai-nbf.org/site/exh-kusamono.html. The Club very much thanks Charles and Jan Herchelroath for providing our guest Young with accommodations while she was in town for the program. Categories: Young Choe | Permalink. GO TO MEMBERSHIP PAGE FOR INFO ON JOINING THE CLUB!